Script coverage is a filmmaking term for the analysis and grading of screenplays, often within the script-development department of a production company. While coverage may remain entirely verbal, it usually takes the form of a written report, guided by a rubric that varies from company to company. The original idea behind coverage was that a producer's assistant could read a script and then give their producer a breakdown of the project and suggest whether they should consider producing the screenplay or not. ^ JohnAugust.com "How accurate is the page-per-minute rule? 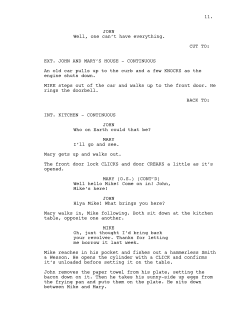 ^ JohnAugust.com "Hollywood Standard Formatting"
^ "Spec Script". Act Four Screenplays. Retrieved August 10, 2012. ^ "What is Script Coverage?". WeScreenplay. Retrieved 5 July 2016.